The Classic Game of Lovecraftian Monster Hunting Returns! The town of Arkham, Massachusetts is in a panic. Horrific and bizarre events have begun to occur with increasing frequencyâ€”all seeming to point towards some cataclysmic event in the near future that may spell disaster for everyone. Only one small band of investigators can save Arkham from the Great Old Ones and destruction! My favorite game of all time (after Heroquest). Great atmosphere and mechanics. It's even been possible for me to get casual players into a more 'serious' game with this one. Mainly because it just looks so cool. Note that while it's technically playable one player, and tempting to do so, it's mind-bendingly difficult, and the long setup time makes it nowhere near worth it. This game is my top game of all time. The atmosphere drips from everywhere and the sense of narative connects you to the characters and the game. The game is also different from most in that it is entirely cooperative. The game is tough as nails too. The sense of accomplishment if you win is immense, and if you lose, you want to try it again as soon as possible to see if you can win. The components are also at the top of the line and it is based on the works of H.P. Lovecraft of whom I am a huge fan. 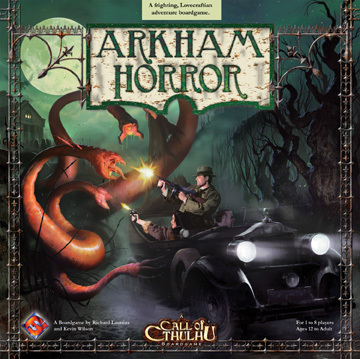 Arkham Horror is based on the Cthulu Mythos of H.P. Lovecraft. If you don't know the genre just say your living your life in the old glory days then one day portals start openning up from other planes and in drop the monsters raising heck and driving people into the looney bin! Your object is to shut down the portals before something seriously big bad Monster comes in and ends the world! This is an awesome game as in it is fully cooperational. The players work together to win so it makes a good choice for playing with people who might be at a variety of game skill playing levels. Easily my favorite cooperative game. Can play from 1 to 8 players (admittedly, with five or more it gets a little too slowed down; and with just the base game five or more also becomes a little too easy to win for my preferences). The game is heavy on the theme and story elements. It is notable in that it is one of the few 'pure' cooperative games I've played that avoids the 'everyone works together so in the end the loudest or most experienced player winds up making all the calls' problem. There is enough variety in what occurs in the base game of Arkham Horror that it won't grow stale quickly. The game does have lots of 'moving parts' and there are a number of rules to learn, so if you like very simple and quick to learn rules, this may not be the game for you. The play time can vary fairly significantly. In my experience, players with a firm grasp of the rules will typically take between one and a half to two and a half hours(and unusually 'lucky' games can go down to either an hour or more than three on very rare circumstances). If you like cooperative games, you like the idea of a bit of an 'adventure' type game in a world based upon the works of Lovecraft, and you don't have a problem with more involved rules, then you should definitely look into Arkham Horror. Great game components and game mechanicns. Very challenging to win, but an overall blast to play. The game might be amazingly complex - utilizing an entire table, an hour in set-up time, and thrice that to play - but it somehow grips even nongamers in its abominable fun. Who can resist a slumbering Elder God? Arkham Horror was a runaway success upon its rerelease, and an abundance of expansions continue to revitalize the base game. Playtested through its earlier incarnation, recrafted with a host of card decks, and lovingly crafted and illustrated, Arkham Horror is a unique, engrossing, and terrifying game. If you like the literature of H.P. Lovecraft, this game is very likely to be a hit. It has lots of RPG-elements, but in a controlled board game environment - works great with people who are used to Roleplaying Games. A great game to play with a group of 4 or even to play by yourself. This game is more about the experience and delving into the story and mythos of the world which is unfolding before you. If you love to be immersed in the theme of the game you play, you'll be hard-pressed to find a better value than Arkham Horror. Bona fide, all-time classic. No game collection is complete without at LEAST the base game. Amazing game. One of the best co-op game I've played, And the best thing is that you can play solo or even 2 playes and yet enjoy the game, unlike other games that are more fun when have more players. Really recomend to everyone to pickup this game. This game is extremely fun, it has a good Lovecraftian feel to it and is the epitome of a co-op game. It's fantastic! You'll look forward to playing it again and again and again! While Arkham Horror is time consuming and a bit fiddly it's also a blast to play. You will need to help each other out in order to survive. Strategy is a must in order to win. This is a very fun and thematic game that scales well from solo play to a large group. One of my favorites! This game is huge, and I mean huge takes up a lot of table space, takes a while to setup, and plays one amazing co-op game. If you and your friends enjoy the Chtulhu mythos and want to team up to take down and Old god this is a game for you. A really fun game with a very well done theme/adventure vibe. Lots of quality components-- does take time to set up-- but if there are multiple players- get each one to do something and play will start much faster. Also helpful- playing with somebody that HAS EXPERIENCE playing before-- sped up game along SO MUCH (they knew how the rules worked, didn't have to refer back tot he rule book much, knew what the next actions/steps were and kept everything on track)-- didn't seem like half as long as some say-- we had a pretty good game in under 3 hours with 5 players.